I’m going through one of my frenzies of cleaning out the fridge and pantry. Every now and again I seem to get a build up of obscure ingredients and just before Christmas when I’m trying to save money is a great time to use them all up. Not only does it tidy up the cupboards but it lowers my grocery bill for a couple of weeks. Today, while rummaging through looking for things to throw in my latest batch of muesli, I found a nearly full bag of coconut flour. 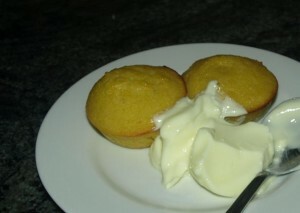 I adapted a recipe for honey muffins and come up with these lovely little morsels. With a dollop of lemon yoghurt, they made a wonderful dessert. I could of used the thermomix to whip these up but First Born was using it to make dinner. Even by hand, they only took a couple of minutes to prepare. Handy thing about these, if you so require, is that they are gluten free. Combine eggs, butter, milk, honey and lemon juice. Stir in coconut flour and baking powder to wet ingredients until there are no lumps. Pour batter into greased muffin cups. Bake at 200C for 15 minutes. Makes 6 muffins. hopefully you can point me n the right direction! I’m not sure what happened for you. The amount of liquids listed has always worked for me and there is less than a cup of coconut flour. I use 60g eggs. Not sure what to suggest. And there is definitely only 3 tablespoons of milk? It just never got to a batter stage when I mixeditball together. they sound so delicious so I would love to get it right! That’s all I used. 9 tablespoons of liquids and 3 eggs should be plenty for 3/4 cup of flour. Have you tried adding a splash more milk yo bring it together? It shouldn’t be a wet batter but it shouldn’t be breadcrumbs either. Thanks, I’ll try adding a little more milk.